What did you expect a writer to pick up on from “Another Portal”? Artist Maura Cunningham: I had not expectations really, just excited to see what was triggered and how that would be brought into written language. This poem was chosen in response to Maura Cunningham’s painting, “Another Portal”—can you talk about the experience of finding words that were in conversation with the image? What leapt out first from Maura’s art? A particular image? A mood? A line? Poet Philip Schaefer: This painting, fitting its title, immediately transported me into the world of the art. The brush strokes, the tepid colors, the “door of light” in the center—all kept me in the mindset of the pastoral. The blue “M” above what I perceived to be the portal stood out as if it were a mantelpiece welcoming the viewer to step forward into anonymity. Lately I’ve been writing a series of short poems that begin with the line “The day I was born,” allowing the poet and reader to switch off any expectations of what the speaker could actually know about such a day. It seemed fitting that I should use this exercise as a way to write into Maura’s work. The invitation to shed reality was ripe. From there, the words just came as they always do: without permission. What surprises you about Phillip’s poem in conversation with your art? Artist Maura Cunningham: So much! it took me to a very specific place and then shook me a bit when I got there. Where the painting is about moving through space, perceptions, experience in a somewhat universal way, the poem took this concept and made it very personal. 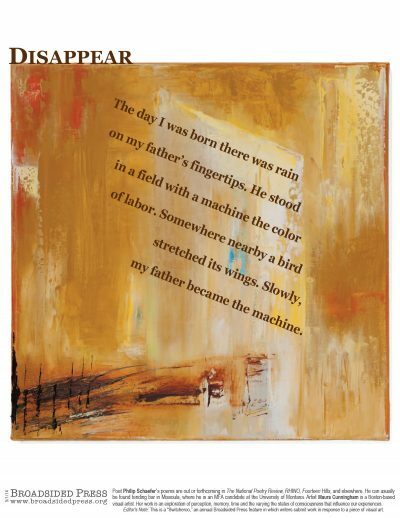 Poet Philip Schaefer: This poem is in conversation with the painting, but now that the text is imposed upon the image, it seems to provide more gravity to the word(s) “machine.” In such a natural landscape, the industrial weight of the word seems to speak quite directly, albeit abstractly, to the title. As an audience we might begin to wonder what exactly this portal is. I think it was Richard Hugo who once said never ask a question in a poem that can be answered. While the question here is more implicit, the idea sticks: we want to step into the portal without knowing where it will take us. Artist Maura Cunningham: I do. The poem is so incredibly visual. I see that dripping rain, the machine the color of labor, the action of the bird, the transformation of the father so vividly. It adds not just a conceptual layer but also a very rich visual layer for me. Additionally, having the text positioned in the painting in such a bold way, right over the center of the main portal….is really directing the audience’s eye and perception of the piece in an almost cinematic style. Poet Philip Schaefer: For me, ekphrastic writing is a great way to exit one’s own experience, both in terms of content and process, and to enter someone else’s. I do it, like aerobics, when I need a break from myself (so not as often as I should). Usually it’s more of a private practice. Artist Maura Cunningham: Yes, it is always incredibly exciting and illuminating to see how and what other people see in the work. Is is often something I was feeling but not fully conscious of. Poet Philip Schaefer: A baby chupacabra. Artist Maura Cunningham: A giraffe kissing an elephant swimming with a dolphin next to a whale on their way to a party at the Octopus condo. Poet Philip Schaefer: Falcor, the luck dragon in The NeverEnding Story. Artist Maura Cunningham: On the wings of a dragonfly flying through the cosmos. Poet Philip Schaefer: My brother Justin is a brilliant painter in the LA area, so I am always entranced by his work. Artist Maura Cunningham: Yes, not super lately but Remedios Varo in a female surrealist show @ Lacma few years ago. Best so far. Poet Philip Schaefer: I’m always reading poetry. From Jim Harrison to Mary Ruefle and Larry Levis to Denis Johnson. A more recent pleasure-boat (for me) has been Christian Hawkey’s The Book of Funnels. Artist Maura Cunningham: Tons! I mostly read non-fiction but just started reading the Wizard of Oz for the first time & it is pretty wild to see where that story began. Note: In the end, two poems sang with Maura’s painting most clearly. Philip Schaefer’s “Disappear” and Lauren Wolk’s “Before Man.” Different in their approaches, both dramatize terrible and beautiful forces at work. Both open new visions of the artwork. In the end, the surprise of Schaefer’s transformation and the subtle link to how time works upon us felt most surprising and resonant. Wolk’s environmental vision of fire, however, was so moving we wanted to share it here as a second consideration of Cunningham’s art. so the world could begin again. Lauren Wolk is a novelist, poet, visual artist, and Associate Director of the Cultural Center of Cape Cod. In 1999, Random House published her first novel, Those Who Favor Fire. Her second novel, Forgiving Billy, was twice nominated for the Pushcart Editor’s Book Award and won the Hackney Literary Award. It awaits publication. Her poetry has appeared in Nimrod, Off the Coast, roger, Naugatuck River Review, Oberon, other literary journals, and anthologies. Note: This broadside is the result of the 11th Broadsided Press Switcheroo. What is The Switcheroo? Every year, during National Poetry Month, we like to turn the tables and invite writers to respond to art we post. All Broadsided artists were invited to submit up to three pieces of work for the Switcheroo. We then asked Gabriel Travis and Kara Searcy, Broadsided artists and the April, 2013 Switcheroo artists, to review the submissions, choosing one that they thought would be open to literary response and would work in the Broadsided format. Out of a very strong group of submissions, we chose “Another Portal,” by Maura Cunningham. This abstract, layered and painterly work was on both of our initial top three lists, which indicates that it was compelling right from the first look. Furthermore, this painting seemed to beg for engagement and a response. We were both drawn in by the piece’s internal tension—between the surface texture and the depth of the the portal-like shape in the center, between the warm rich colors punctuated by cool blue, between the visual invitation of the bright middle and the barrier-like slash marks in the the lower left. The knifed and brushed layers of paint create the effect of a building’s crumbling old facade, and it is hard to leave their warm and homey sense of history, even as your eye is drawn to the cool austerity and pure light of the portal, where there is a possibility of renewal or rebirth. The title, “Another Portal,” helps create this extra layer of meaning in this gorgeous painting. Poet Philip Schaefer‘s poems are out or forthcoming in The National Poetry Review, RHINO, Fourteen Hills, Pacifica, Calliope, Toad, The Chariton Review, Noon and elsewhere. He is also the recipient of an Academy of American Poets prize. Philip can usually be found tending bar at the local distillery in Missoula, where he is an MFA candidate at the University of Montana. He is haunted by waters. Artist Maura Cunningham is a Boston based visual artist. Using a variety of media, her work is an exploration of perception, memory, time and the varying the states of consciousness that influence our experiences. www.mauracunningham.com. Image: “Another Portal,” 12″ x 12″, oil on canvas. Artist Maura Cunningham digs Vectorizing at her local hardware store.